SpaceX’s robotic Dragon cargo craft begins its separation from the International Space Station after being released from the Canadarm2 on Aug. 3, 2018. Dragon splashed down in the Pacific Ocean off the coast of Baja California later that same day. 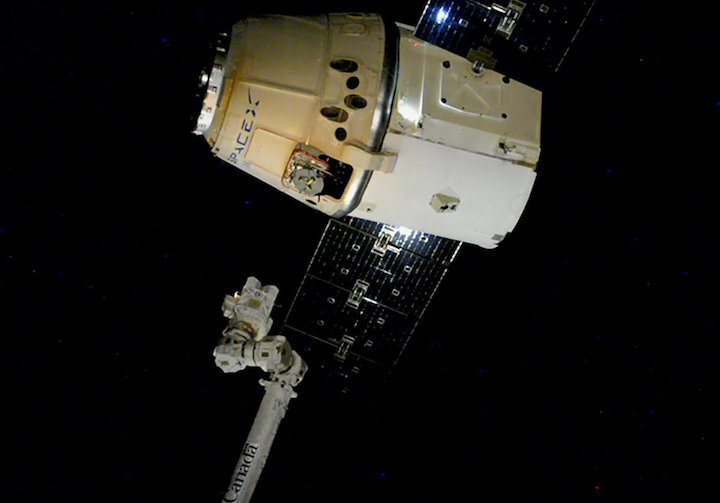 SpaceX's robotic Dragon capsule returned to Earth today (Aug. 3), wrapping up the company's latest cargo mission to the International Space Station (ISS). Dragon splashed down in the Pacific Ocean off the coast of Baja California, Mexico, shortly after 6 p.m. EDT (2200 GMT), about 5.5 hours after departing the orbiting lab. A boat will soon pluck the freighter out of the sea and haul it back to shore, where technicians can begin offloading the gear that Dragon brought down to Earth. And there's a lot of stuff to offload — "several tons of experiment results and orbital lab hardware," NASA officials wrote in an update Wednesday (Aug. 1). Many of the research samples are packed inside special portable freezers, they added. Dragon launched atop a two-stage SpaceX Falcon 9 rocket on June 29 and arrived at the space station on July 2. The uncrewed capsule brought about 5,900 lbs. (2,700 kilograms) of supplies, food (including treats such as blueberries and ice cream bars) and scientific equipment to the ISS. Among the science gear toted up were an intelligent robotic "astronaut helper" named CIMON (short for "Crew Interactive Mobile Companion") and NASA's Ecosystem Spaceborne Thermal Radiometer Experiment on Space Station (ECOSTRESS) instrument. ECOSTRESS will be affixed to the station's exterior and track how plants respond to heat stress and a lack of water around the globe. This particular Dragon has now flown two ISS missions; it previously visited the orbiting lab in 2016. The first stage of the Falcon 9 that lofted the capsule was pre-flown as well, having helped launch NASA's Transiting Exoplanet Survey Satellite in April. Such reuse is a priority for SpaceX billionaire founder and CEO Elon Musk, who sees it as a way to slash the cost of spaceflight and make a variety of bold exploration goals economically feasible. The splashdown wasn't the only Dragon-related news of the day. NASA also announced the nine astronauts who will fly on the first crewed missions of the astronaut-taxi version of Dragon and Boeing's CST-100 Starliner capsule. SpaceX and Boeing have been developing these crewed spaceships for several years under multibillion-dollar contracts with NASA. The current schedule calls for Crew Dragon to fly its first crewed test flight to the ISS in April 2019, and for Starliner to do the same a few months later.